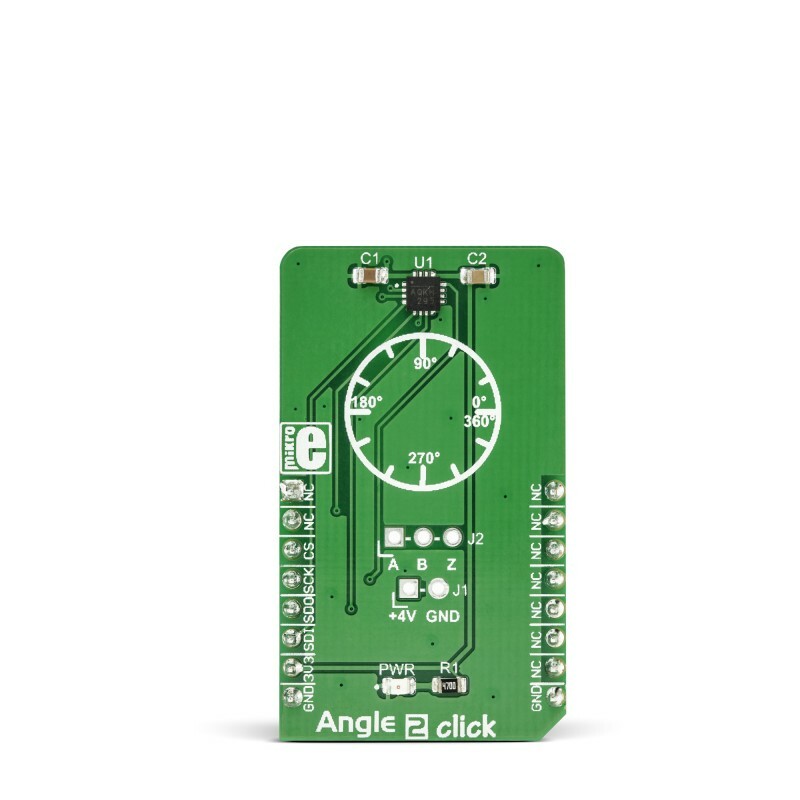 Angle 2 click is a magnetic rotational sensor which relies on the ultra-fast MA700 angular sensor IC. Due to a high data output rate of 500kHz, the MA700 IC is able to provide a reliable absolute angular positional data at speeds up to 100,000 RPM. This can be achieved by utilizing the advanced Spinaxis technology based on a direct angle sampling approach, instead of using the extensive arctangent computations and other similar solutions. This also allows for relaxed mechanical tolerances, allowing even the off-axis magnetic field to be used. The MA700 sensor IC features quadrature encoded outputs so that it can directly replace similar mechanical devices. The advantages of a contactless quadrature encoder are many, therefore Angular 2 click is equipped with a three-pin header, offering an easy access to these outputs. An OTP memory can be utilized to permanently store application-specific settings, such as the zero-angle position. 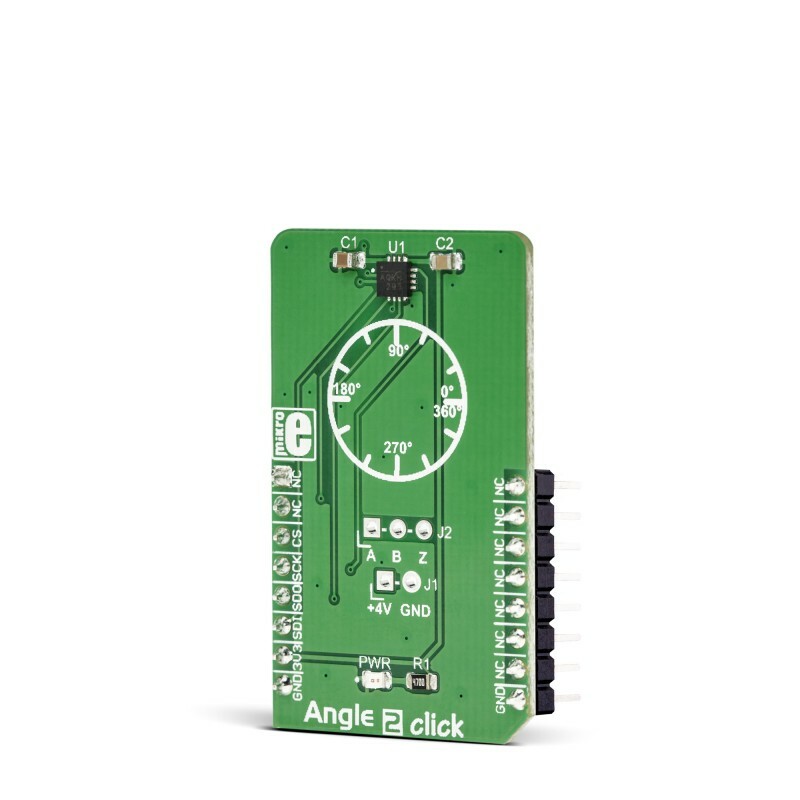 Features such as the low-latency angular data acquisition, high reliability of the Spinaxis technology, quadrature encoder outputs, and fast SPI interface, make the Angle 2 click a perfect solution for various applications that require a reliable angle sensing. It can be used for servo drives, in various robotic and automotive applications, for the BLDC motor speed detection, as the mechanical quadratic encoder replacement, and more. Angle 2 click is based on the MA700 IC, an angular sensor for position control with side-shaft positioning capability, produced by Monolithic Power Systems (MPS). This IC has a set of features, critical for high-speed angular position sensing applications: it utilizes the Spinaxis frontend that allows very fast data output rates up to 500kHz, and a very low-latency data output, down to 3 µs, even when using the data filtering and conditioning options. This makes it suitable for measuring the angle of the motor shaft in various high-speed applications, such as BLDC motor applications. It can be used at speeds up to 100,000 RPM, still retaining its accuracy. The magnetic field is only sensed along the horizontal (XZ) plane by utilizing an array of aligned Hall sensors. This allows sampling of the absolute angular position of a diametrically magnetized cylinder, typically attached at the end of the rotor shaft. Unlike some other methods, the Spinaxis does not require heavy mathematical calculations, as it is based on the phase detection, directly digitizing the magnetic field direction. This is the key to an extremely low output latency of 3µs. This also allows very accurate angular position reading, as the actual physical angle coincidences with the 11-bit data available at the output, due to practically no conversion delay. The Spinaxis frontend also allows off-axis placement of the permanent magnet, as the MA700 features built-in linearization for the side-shaft mounting in a form of an offset register. This relaxes the mechanical demands of the user application. The incremental quadrature encoder function uses three output pins: A, B, and Z. The A signal pulses 256 times during a full revolution. The B signal is shifted by a quarter of the pulse period, depending on the direction of the rotation. The application can use this fact to determine the direction of the rotation. The Z signal pulses once per 360°. The pulses on A and B outputs are affected by jitter, which can cause the output to be inconsistent if used at speeds over 30,000 RPM. For high-speed applications, using the SPI interface is recommended. The A, B, and Z pins of the MA700 IC are routed to a standard, 2.54 mm (0.1 inches) pitch 1x3 header, mounted on the Angle 2 click, so it can be easily accessed by an external application. The MA700 also features the one-time programmable (OTP) memory, which allows the working parameters of the IC to be stored as the default values. This allows a lot of flexibility for a project design since the factory pre-flashed default values might not always fit the requirements of the specific application. A typical example might be the zero-position configuration: if the sensor must be fixed to a certain angle which has to be the start position for the angle counting (the zero angle), the user application would have to internally re-calculate values to compensate, introducing more latency. The ability to define own default settings is certainly a useful option. However, flashing the OTP memory is a sensitive process, as there is very little room for an error (being one-time programmable). 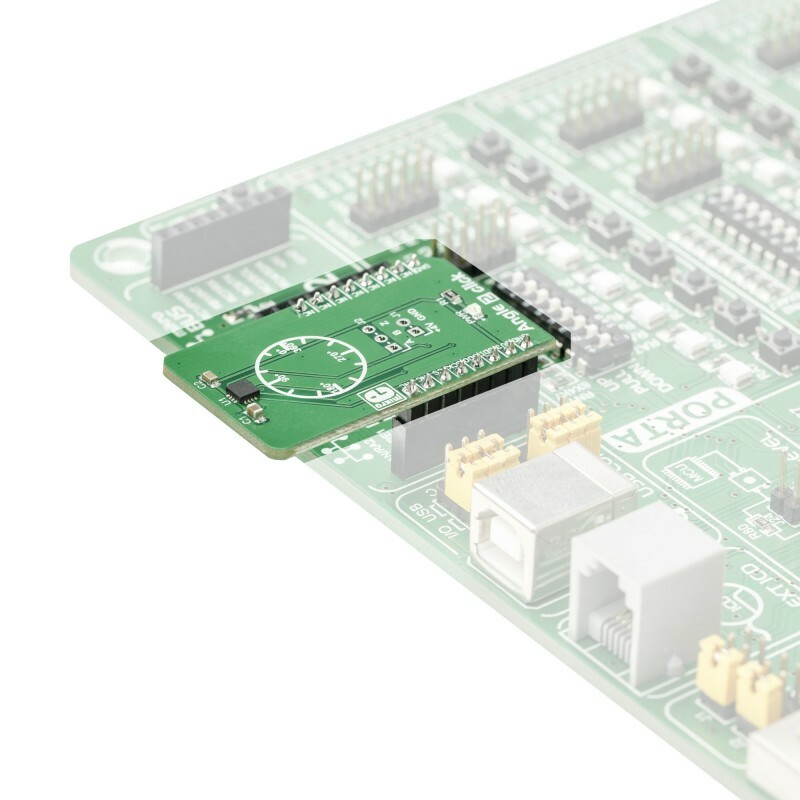 The datasheet of the MA700 offers a detailed guide for flashing the OTP, while Angle 2 click offers an external power supply (PSU) connector, implemented as the standard 2.54mm 1x2 header. The OTP flashing requires a separate PSU of 4V to be used. The SPI communication consists of the read/write (R/W) command, an address of the register, and the data. The R/W command and the address are two 4-bit values, while the data is a single 8-bit value. 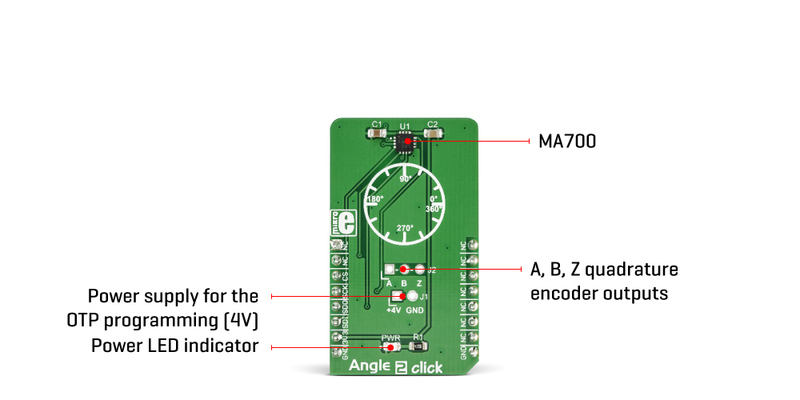 The MA700 datasheet contains the detailed information on all the commands, however, Angle 2 click comes with the library that contains very simplified angle reading functions, as well as the functions used for an easy configuring of the Angle 2 click. 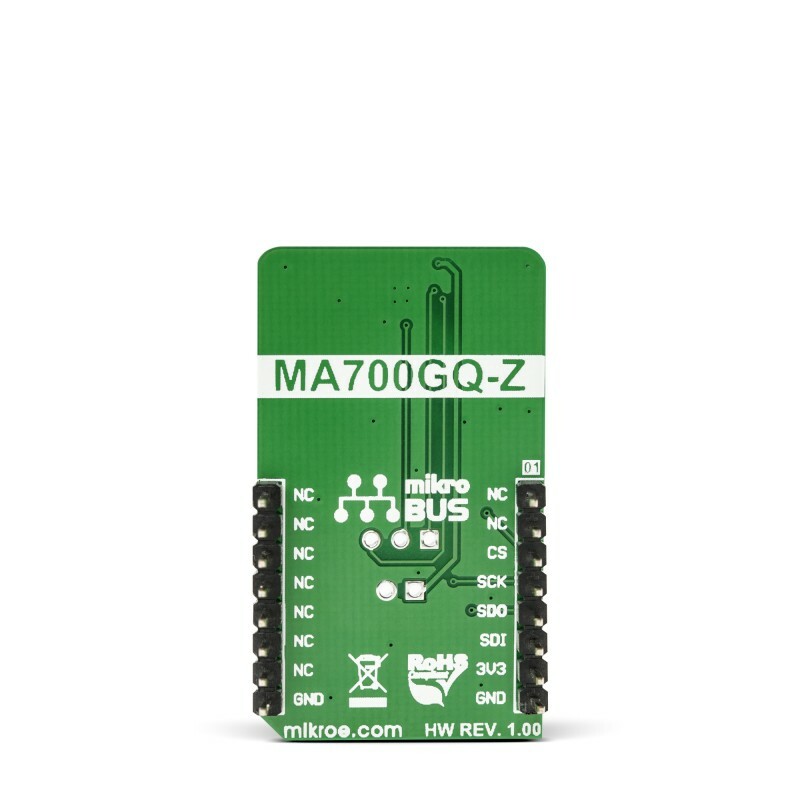 The MA700 SPI pins are routed to the respective pins of the mikroBUS™, allowing easy and reliable interfacing with the host MCU. Key Features Accurate sensing of the magnetic angle at up to 100,000 RPM, good linearity and low error margin even when used with the off-axis magnets, latency-free Spinaxis technology, OTP memory for permanent storing of the default parameters, etc. This table shows how the pinout on Angle 2 Click corresponds to the pinout on the mikroBUS™ socket (the latter shown in the two middle columns). We provide a library for the Angle 2 click on our LibStock page , as well as a demo application (example), developed using MikroElektronika compilers. The demo can run on all the main MikroElektronika development boards. The library can perform a control of the Angle 2 Click board. Also can measure the angle value in degrees with a range of 0 deg to 359.91 deg. Zero position setting also can be performed by using this library. The library offers a choice to save content of an entire selected register in OTP memory. For more details check documentation. T_ANGLE2_DEG_VAL angle2_writeReg( uint8_t regAddr, uint8_t dataIn ) - Function writes one byte data to the register. T_ANGLE2_DEG_VAL angle2_getAngle( void ) - Function returns angle value in degrees with a range from 0 to 359.91.
void angle2_setZeroScale( T_ANGLE2_DEG_VAL zeroDeg ) - Function sets a zero position value in degrees with 12-bit resolution. Application Initialization - Initializes SPI interface in Mode 3 and performs a device configuration for properly working. Application Task - (code snippet) - Reads angle value in degrees and logs results on uart terminal. void floatCut() - Makes float value to be rounded on two decimal places.